The American Academy of Pediatric Dentistry as well as American Academy of Pediatrics recommends the children to have their first dental visit after the eruption of the first tooth and no later than their first birthday. Early examination and preventive care will protect your child’s smile now and in the future. Dental caries is the most common chronic disease of childhood in America, affecting 50% of first graders and 80% of 17 year-olds. At Vienna Pediatric Dentistry our goal is to prevent disease rather than treating the results of disease. Start your child early on a life time of good dental habits. We strive to make the first visit a positive and enjoyable one for your child. We want your child to get to know Dr. Ganjavi and staff, and be comfortable in our office setting at all times. 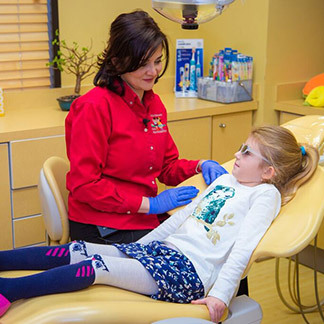 A positive and comfortable first visit builds trust and helps put your child at ease during future dental visits. Let your child know that the doctor will explain everything in detail and will answer any questions your child might have. Parents should not make a big deal out of the visit and refrain from using words that could cause necessary fear, such as “needle” or “drill”. We are trained and have experience in dealing with children with anxiety and can explain treatment procedures in a positive and pleasant manner to avoid any anxious or negative feeling toward dentistry. At your initial visit we take special interest in you and your child’s medical history. Knowing as much as possible from the very beginning allows us to develop a customized prevention plan for your child. We will complete a comprehensive oral examination and discuss any findings with you. Cleaning of teeth, flossing, scaling (if needed) and in office fluoride treatment will be performed if your child is cooperative. Finally, we will discuss and review diet, home oral hygiene and nutritional practices and assess your child’s occlusion (bite). A diagnosis and treatment plan will be discussed with parents at the end of the appointment.We are sensitive to children's needs and it is our goal to make your child feel comfortable visiting our practice while providing the best care possible.